Habit: Annual, taprooted; often strongly scented. Stem: decumbent to erect, 1--several from base, 2--90 cm, simple or generally +- openly branched, distally glabrous or sparsely hairy to woolly, often glandular. Leaf: simple, alternate, entire to pinnately lobed; basal generally withered at flower (persistent), petioled or sessile, 4--11 cm, linear to oblanceolate or spoon-shaped, lobes (if present) toothed; cauline sessile (occasionally clasping), reduced distally on stem, 1-veined, linear to ovate or obovate, glabrous or sparsely hairy to woolly, occasionally with stalked or bead-like sessile glands. 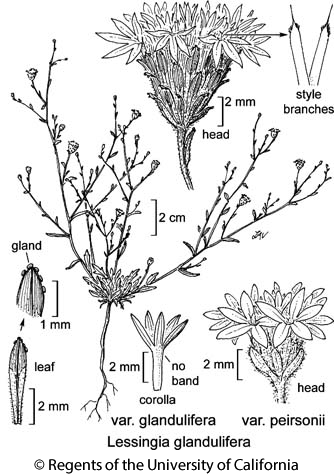 Inflorescence: heads radiant, generally slender-peduncled in open cyme- or panicle-like clusters (+- sessile in spike- or head-like clusters); involucre 4--13 mm diam, narrowly cylindric or fusiform to obconic or hemispheric; phyllaries 10--55, graduated in 4--8 series, erect or recurved, persistent, spreading or reflexed in age, texture leaf-like or scarious (papery), tips green or +- purple-tinged, glabrous or sparsely hairy to woolly, often glandular; receptacle slightly convex, shallowly pitted, epaleate. Disk Flower: 3--40; corolla funnel-shaped to tubular, white, pink, lavender, or yellow, limb +- palmately expanded in peripheral flowers, lobes erect or spreading; anther tip awn-like; style branches 0.8--2.5 mm, appendage 0.3--1.3 mm. ; colored band inside each present or not, lobes 5; anther base +- rounded; style-branch appendage lanceolate or short-triangular with abrupt point 0.1--0.4 mm. Fruit: 1--5 mm, cylindric to obconic, not compressed, smooth or obscurely 5--10 nerved, faces tan or mottled purple-brown, densely puberulent to long-soft-hairy; pappus of 3--55 persistent bristles, free, fused at base, or fused throughout into awns, occasionally reduced to crown, white, tan, or +- red. Chromosomes: 2n=10, except Lessingia nemaclada, 2n=10,12. Species In Genus: 12 species: California; western Nevada, northwestern Arizona, northern Baja California. Etymology: (C.F. Lessing, German-born botanist, 1809--1862) Note: Other species now treated in Benitoa and Corethrogyne. Stem: +- erect, 5--40 cm, tan, distally puberulent and/or sparsely hairy to tomentose (glabrous). Leaf: basal petioled, sometimes not withered at flower; cauline oblong to oblanceolate, generally entire, occasionally toothed to pinnately lobed, reduced distally on stem to awl-shaped bracts, 0.2--2.5 cm, puberulent and/or sparsely hairy to tomentose (glabrous), margins generally with bead-like sessile glands. Inflorescence: involucre 4--7 mm, obconic to cylindric; phyllaries oblong, puberulent and/or sparsely hairy to tomentose (glabrous), tips erect, green, generally with bead-like sessile glands. Flower: 10--30; corolla funnel-shaped, yellow, tube not purple-brown banded inside; style branch appendage 0.3--1.3 mm, lanceolate, tapered. Fruit: 1.5--3.5 mm; pappus >= fruit, white to tan. Unabridged Note: As here circumscribed, Lessingia glandulifera including plants that lack a colored band in corolla tubes and have lanceolate style-branch appendages (others have treated those plants as Lessingia lemmonii). Stem: sparsely hairy to tomentose. Leaf: 0.2--2 cm, persistently tomentose. Inflorescence: phyllaries persistently tomentose. Flower: 10--25, style branch appendages 0.6--1.3 mm. Citation for this treatment: Staci Markos 2012, Lessingia glandulifera var. peirsonii, in Jepson Flora Project (eds.) Jepson eFlora, http://ucjeps.berkeley.edu/eflora/eflora_display.php?tid=82222, accessed on April 20, 2019.
s SNF, e WTR. Markers link to CCH specimen records. Yellow markers indicate records that may provide evidence for eFlora range revision or may have georeferencing or identification issues. Purple markers indicate specimens collected from a garden, greenhouse, or other non-wild location.